In today's economic climate, more than one in three American labor force participants (35%) are Millennials (born between 1981 and 1996), which presently makes them the largest generation in the U.S. labor force (Pew Research Center analysis of U.S. Census Bureau data). More specifically, over 56 million Millennials are either working or currently looking for work, as compared to 53 million Generation Xers and 41 million Baby Boomers. Therefore, as a way to accommodate this growing shift as a business owner, consider making your business more inclusive for this younger generation. I am NOT suggesting that you try making your office "cooler," such as adding hammocks and Skee-ball machines (as awesome as that does sound), however, I AM suggesting that you evaluate the efficiency and suitability of the tools your business uses on a daily basis. Millennials love technology, specifically good technology. They've grown up with computers (seriously, many have started using computers as early as Pre-K). And they have seen firsthand the growth and refinement of these devices in recent years. So, provide them with updated technology, and they will thrive. To help illustrate the importance of this point, Penn Schoen Berland conducted a survey and found that 42% of Millennials are likely to quit a job with substandard technology, and furthermore, 82% of Millennials say that workplace technology would have an influence when deciding to take a new job. As such, updating office technology is key to increasing employee productivity and retention in the long run. First, consider updating tools such as Microsoft Office. These recent applications have kept businesses in mind, and contain many new and useful features. And as most Millennials are already using these newer versions, updating them for your employees just makes sense. Second, instead of buying brand new computers for the entire office, consider upgrading the operating systems for the computers you already have. It's actually amazing how many businesses have held on to old systems. A Spiceworks survey in 2017 reported that around 69% of businesses were still using Windows 7 (an OS released in 2009). And it makes sense, why would you upgrade when the system works? But keep in mind, change is a necessary part of business, and many of the newer operating systems are much faster and reliable (plus they have better support), which translates to greater efficiency. So don't be afraid to upgrade, it shouldn't cost you much extra, productivity should increase, and the younger employees will thank you for it. Just remember to back up your files! Easy to use: Time clock software should make Millennial's lives easier, not more difficult. Therefore, choose a system that is intuitive, responsive, and straightforward. The less time you have to spend training your employees, the better. Therefore, choose a time and attendance system that Millennials can pick up and start using right away. Stellar Interface: Millennials appreciate a well-designed user interface. Clean and navigable webpages, without annoying pop-up ads, makes for a pleasant experience. In general, visually appealing software (whether conscious or subconscious) can lead to a happier workforce. Mobile friendly: Mobile optimization is a popular feature in today's modern world. Given that more than 9-in-10 Millennials (92%) own smartphones, AND a full 28% are smartphone-only Internet users (meaning they don't use traditional broadband Internet services at home), using mobile time clock software is a smart choice for young employees (Pew Research Center). It's quick, easy, and gives employees a greater sense of freedom. With these features in mind, choose a time clock service that works well for everyone (including Millennials). If you need help finding a good option, give Webtimeclock a try. Here's a link to a free 15 day trial. Finding a service that makes everyone happy and productive should be the ultimate end goal. Finally, the best tip for helping Millennials thrive in the workplace is to listen to them. Create an open and communicative work environment, and hear what they have to say. Maybe there's a new streamlined communication tool they wish to share with their co-workers, or maybe they wish to stand at their desks more often during work hours. You never know. Whatever it may be, hear them out. They very well could help solve a productivity problem that you didn't think of. Create a suggestion box, frequently offer quick surveys, and hold open discussion meetings as much as possible. The more you listen to your employees, the better off everyone will be. Businesses can benefit from relinquishing negative stereotypes and working with Millennials as equals. These are adaptable and bright individuals. And given that Millennials now make up the majority of the labor force, they are integral to the health of our economy. 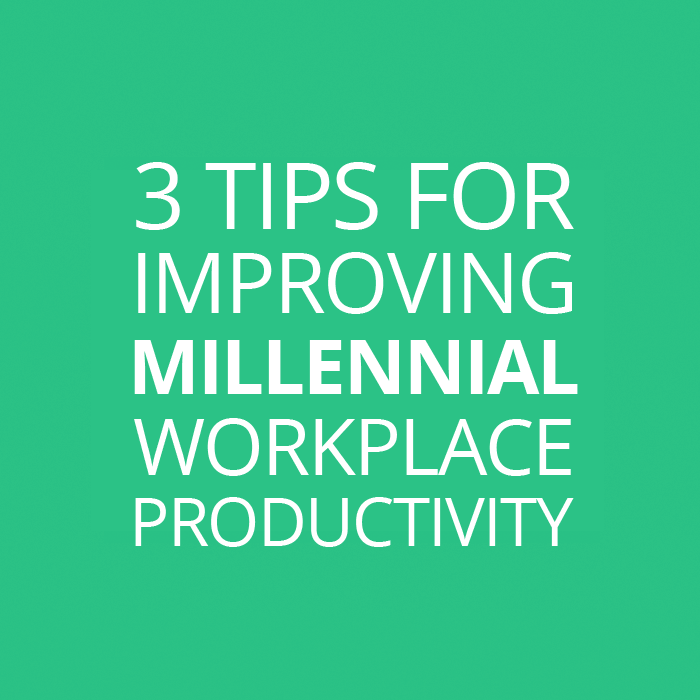 As such, updating office technology, utilizing the best time clock software, and listening to your employees are the three best ways for helping Millennials reach their maximum potential. If you can achieve all three, you'll contribute to a better and brighter workplace for the future.